Linji Yixuan, founder of a school of Ch’an Buddhism in 9th-century China, was said to have scornfully dismissed Buddhist terms such as “Bodhi” and “Nirvana” as stakes for tethering donkeys. 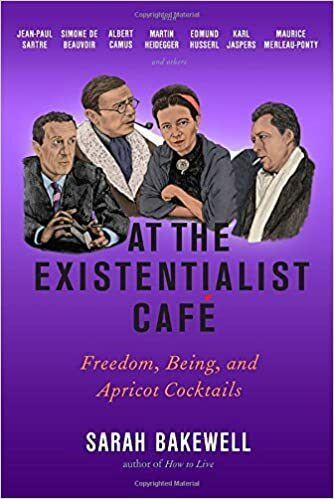 In reading Sarah Bakewell’s At the Existentialist Café, I found myself wishing that the prominent figures in phenomenology and existentialism, Edmund Husserl, Martin Heidegger, and Jean-Paul Sartre, had studied under a similar instructor who might have imparted a sense of skepticism toward the possibility of capturing the essence of experience in words like “Being” and “Authenticity”, or, as in the case of Heidegger, torturous compound German phrases. Bakewell’s previous book, an unconventional biography of Montaigne, was a treasure. I was eagerly anticipating this one as a result, especially given that I have become increasingly convinced that I am the victim of a hypnotist’s lingering prank, one in which I was rendered incapable of remembering the slightest interesting thing about Heidegger’s philosophy within mere minutes of having finished reading about him. If anyone could help me understand why this man is worth my time and attention, Bakewell could. It meant: don’t waste time on the interpretations that accrue upon things, and especially don’t waste time wondering whether the things are real. Just look at this that’s presenting itself to you, whatever this may be, and describe it as precisely as possible. There is at least a superficial similarity to Zen philosophy here, but in practice, the phenomenologist project appears more like an attempt to greedily attend to the quotidian details of experience in a possessive manner. I once heard a metaphorical description of conscious awareness as a thin penlight being used to search within a darkened warehouse. Bakewell’s paraphrases of the original material, however lucid, seem to me to describe an attempt to shove as much experience as possible out of the shadows, into that narrow beam of light. At this point, it becomes curious to note that Charles Darwin is mentioned only once in passing. Not that he should have played a role in Bakewell’s story, of course, but his absence in the thought of her subjects, nearly a century after his discoveries, seems significant (for that matter, one might think Kant’s criticisms of empiricism, a half-century before Darwin, should have likewise tempered the urge to wallow in the deluge of sensory stimuli). Evolution did not mold the human brain as a truth-seeking machine. Like all other evolved beings, we adapted to our environments at a cultural snail’s pace, according to our most pressing needs. The fact that we ruthlessly filter our experience along established patterns and ignore most things which seem irrelevant to our needs and interests is evidence of our minds working in the most efficient manner possible within their enforced constraints, rather than evidence of a moral or intellectual failing. Subjecting our experiences to hyper-focused scrutiny is something that can only be done in short bursts — the cognitive burden is too taxing. Is the effort worth it, though? Will sustained attention to this, whatever this may be, burn a hole through the layers of illusion to the authentic truth beneath? I’m skeptical, to say the least. In his book Fools, Frauds and Firebrands, Roger Scruton referred a few times to Sartre’s “Satanic” pride (Satanic in the sense of Milton’s anti-hero). We see evidence of this here as well, with both Sartre and his partner Beauvoir struggling to accept the necessity of death. As Bakewell says about Sartre, “everything in his personality revolted against being hemmed in by anything at all, least of all by death.” Phenomena, of course, will go on after our individual deaths; countless living beings will partake of the same experiences that we have had. What offends Sartre’s immense pride is the fact that death means “I” can no longer hoard one particular collection of memories as “mine”. I found it unexpectedly poignant to consider this particular tragic flaw, especially as there were so many others of his that failed to inspire much sympathy. All these devices work because they allow us to pretend that we are not free. We know very well that we can always reset the alarm clock or disable the software, but we arrange things so that this option does not seem readily available. If we didn’t resort to such tricks, we would have to deal with the whole vast scope of our freedom at every instant, and that would make life extremely difficult. Most of us therefore keep ourselves entangled in all kinds of subtle ways throughout the day. For Sartre, we show bad faith whenever we portray ourselves as passive creations of our race, class, job, history, nation, family, heredity, childhood influences, events, or even hidden drives in our subconscious which we claim are out of our control. — stir my blood and quicken my pulse, just like when I first discovered existentialism in philosophy class many years ago. We could do with a lot more emphasis on “radical freedom” in our own time, when the urge to shrug off the burden of our own agency is as tempting as ever, especially when encouraged by the latest theories in sociology and neuroscience. All in all, a satisfying read, even if Heidegger is destined to remain opaque to me.